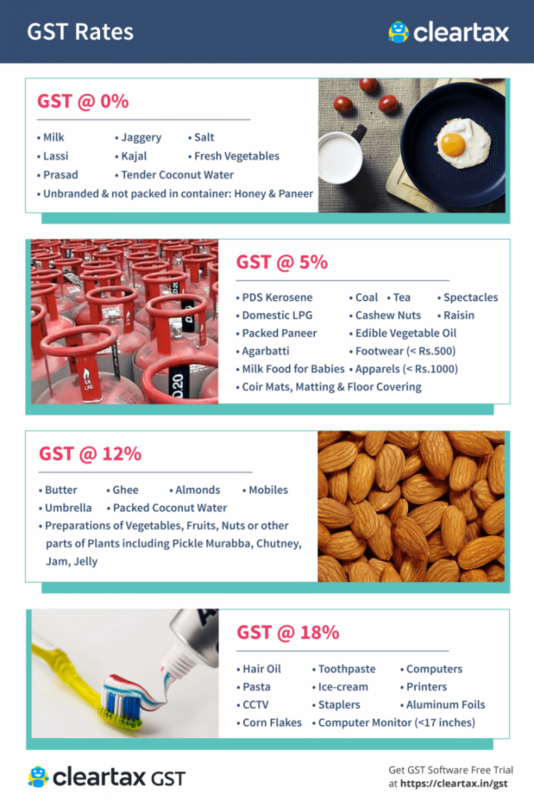 So in this article, we bring you our analysis of these GST rates. The latest meeting-33rd GST Council meeting is rescheduled on 24th February 2019 from earlier date 20th February 2019. 31st GST Coucil meeting was held 22nd December 2018. GST Rates for 23 Goods and 3 Services have been revised*. *For travel by non-scheduled/chartered operations for religious pilgrimage which are facilitated by GoI under bi-lateral agreements. 70% of value is considered as supply of goods and taxed at 5% GST. Remaining 30% of the EPC contract value is supply of service and attracts standard tax rate for service. -Rate of 5%/18% to be applied based on transaction value of footwear. -Uniform GST rate of 12% on Flexible Intermediate Bulk Container (FIBC) from existing 5%/12% (depending on the value). Supply of gold by Nominated Agencies to exporters of article of gold Jewellery. Proceeds received by Government from auction of gifts received by President, Prime Minister, Governor or Chief Minister of a State and public servants, the proceeds of which is used for public or charitable cause. Vehicles imported for temporary purposes under the Customs Convention on the Temporary importation of Private Road Vehicles (carnet de passages-en-douane) will be exempt from IGST and Compensation cess. Services supplied by rehabilitation professionals recognised under Rehabilitation Council of India Act, 1992 at hospitals, schools or rehabilitation centres established by Government or charitable institute registered under Section 12AA of The Income tax Act,1961. Loan guarantee services provided by Government to its undertakings and PSUs for bank loans. 28th GST Council Meeting was held 21st July 2018. GST Rates for 45 Goods and 2 Services have been revised*. 4. Services provided by an unincorporated body or non profit entiy registered under any law to own members upto Rs. 1000 per year of membership fees. 2. Services provided by FSSAI to food businesses. 4. Services provided by the installation and commissioning by DISCOMS for extending electricity distribution network for agricultural use. 1. Guarantees given by central/state government to their undertakings/PSUs. 2. Services provided by government to ERCC by assigning the right to collect royalty to mining lease holders. 2. GST rate slabs will apply on the actual rate for hotel services instead of declared tariff. *Note that Rate changes, Exemptions and other proposals made shall be given effect once the Notifications are issued for the same. GST council has made the much-awaited announcements around tax rates on various categories of goods on 18th January 2018 at Vigyan Bhavan, Delhi. There has been a hype around these rates for a while and now these GST rates are finally in the public domain! GST Rates for 29 Goods and 53 Services have been revised*. Click here to read all updates of the meet. GST Rates for 178 items have been reduced from 28% to 18%. Click here to read all updates of the meet. For Restaurants within hotels, and room tariff less than Rs. 7,500 the GST rate is 5%. Also, the credit of ITC paid on inward supplies cannot be taken. For Restaurants within hotels, and room tariff greater than Rs. 7,500 the GST rate is 18% and credit of ITC paid on inward supplies can be availed. Outdoor catering continues to be charged at 18% with the availability of ITC on inward supplies. Sugar, Tea, Coffee and Edible oil will fall under the 5 % slab, while cereals, milk will be part of the exempt list under GST. This is to ensure that basic goods are available at affordable prices. However, instant food has been kept outside this bracket so, no relief for Maggie lovers! Coal to be taxed at 5 % against current 11.69 %. This will prove beneficial for the power sector and heavy industries which rely on coal supply. This will also help curb inflation. Expect a good run for Coal India tomorrow. The ‘mithai’ from the neighbouring sweet shop might lose some of its flavors as Indian sweets will now be taxable at 5 %. If you have a sweet tooth, this could hurt your pocket a wee bit in the coming days. Toothpaste, hair oil, and soaps will all be taxed at 18 %, where currently they are taxed at 28 % Most of the cosmetics and fast moving consumer goods (FMCG) brands should get the benefit of this tax reduction. After all, Fair and Lovely might seem fairer in its pricing from now on! If you are using any version of Tally as accounting software, you can easily import all your sales and purchase data to ClearTax GST software and file your returns. 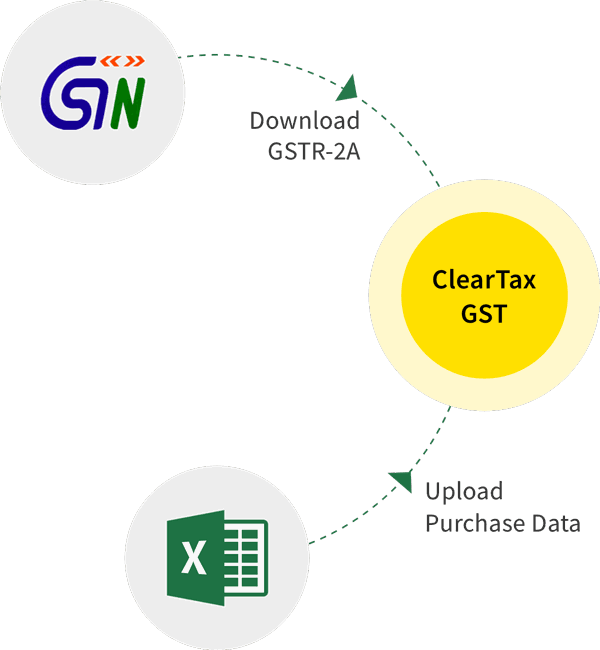 Now you can integrate your Tally data and use ClearTax GST software for all GST compliance.